Simon Dowson and Nick Carpenter, founders of STC member company Delta Motorsport, have been announced as two of Grant Thornton UK’s prestigious 100 Faces of a Vibrant Community for 2018/19. The Faces programme celebrates individuals for their innovation, growth and purpose within diverse sectors and industries across the UK. Grant Thornton is one of the world’s largest professional services networks of independent accounting and consulting member firms. It is also on the STC Board. 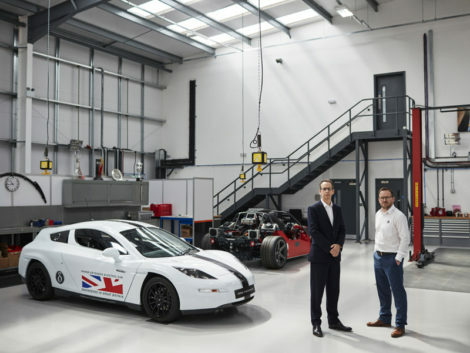 Since launching Delta as a start-up business at Silverstone Park in 2005, Simon and Nick have developed their business into one of the UK’s leading names in hybrid and electrification vehicle technologies. It now occupies 18,500 sq ft of accommodation in which it employs 40 people and has also recently diversified into autonomous vehicle design. Simon commented: “Nick and I are very proud to have been inducted into Grant Thornton’s 100 Faces of a Vibrant Community programme which highlights the need for business thought leadership. “Similarly forward thinking, collaboration and networking which have helped us over the past 15 years to build Delta Motorsport from a small start-up to a company of 40 people. And added Nick: “This is a wonderful accolade for Delta Motorsport and reward for perseverance in business!